One swing of the bat during the 1975 World Series made Carlton Fisk world famous and a Boston Red Sox fan favorite for life. However, it was his longevity at the catching position that placed him at the top of many of the position's statistical lists and earned him a spot in the Hall of Fame. 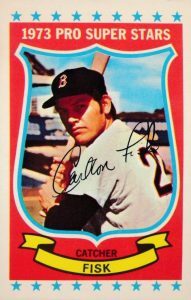 This top list showcases some of the best Carlton Fisk baseball cards available to collectors. Shop for Professionally Graded Carlton Fisk cards on eBay. Given the nickname "Pudge" as a kid, the moniker stuck with Fisk as he made his way to the major leagues. He was drafted by the Red Sox in 1967 and earned brief MLB appearances in 1969 and 1971 for a total of 16 games. 1972 would be both his first full season and his breakout year, as he hit .293 with 21 home runs and a league-leading nine triples. Fisk would also capture both the Gold Glove and the American League Rookie of the Year, becoming the first player to be chosen unanimously as the ROY. Fisk's most famous moment as a player occurred during the 1975 World Series when the Red Sox were battling the Cincinnati Reds for the title. In the 12th inning of Game 6, Fisk hit a towering home run to left field that was arching towards the foul pole. As he was running down the first base line he began to make a waving motion to keep the ball in fair territory, which it did, giving the Red Sox a Game 7 and Fisk became a hero to Boston fans everywhere. The best season for Carlton Fisk with the Red Sox came in 1977 when he hit .315 with 26 home runs and 102 RBIs. He remained with the team until the 1981 season when he signed with the White Sox, where he would play through the rest of his career until 1993. He retired as the all-time leader for catchers in games and seasons as well as most career home runs. Fisk would have his jersey number retired by both of his teams and was elected to the Hall of Fame in 2000. 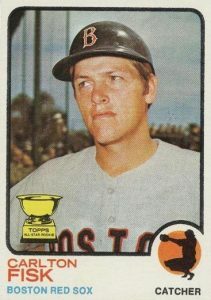 Collectors interested in expanding their early Carlton Fisk collection beyond the cards featured on this list can find two early appearances in some short-lived Topps products. Fisk was included in 1973 Topps Candy Lids, which as the name suggests were player cards that also served as the lids of Topps chewing gum tubs. Although officially released in 1973, Topps issued a small test issue in 1972 in which Fisk was also featured. If you can track down that limited appearance, it is worth ten times the value of his 1973 lid. Fisk was also part of the 1974 Topps Deckle Edge set that was famous for its unusually cut borders and his appearance on the 72-card checklist is one of the most valuable of the group. You'll notice from this top list that Fisk's position as catcher lends itself well to creating some memorable cards. Two interesting action shots that didn't quite make the list include his 1982 Topps base card in which Fisk is jumping, fully-extended, trying to catch a foul ball and his 1984 Topps card where he is running down the first base line in his full catcher's gear. Narrowing down from the hundreds of cardboard options, this list highlights cards from throughout Fisk's 24-season career. Card value was the main determining factor used in building the list, but the card's popularity and availability to the collector was also considered. 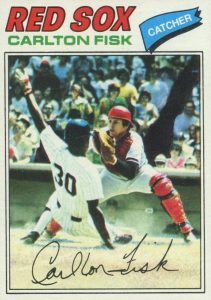 We begin the list of the best Carlton Fisk cards with his 1977 Topps issue that features an amazingly timed photograph of a play at the plate between Fisk and Yankees 2nd baseman Willie Randolph. Taking a look at box scores from the time, the play seems to have occurred on July 24, 1976, with Randolph being safe at the plate after scoring from 3rd base on a sacrifice bunt. The Red Sox/Yankees rivalry would play a significant part in Fisk's early career, including a feud with his Yankees catching counterpart at the time, Thurman Munson. Fisk debuted in the Hostess trading card sets in 1975 along with two Baltimore Orioles: slugger Lee May and Hall of Fame 3rd baseman Brooks Robinson. The inclusion of Robinson adds some additional value to the uncut three-card panels that were spared the scissors. Credit must be given to the designers of the Hostess cards as the three cards don't share a border, allowing for cleaner-cut individual cards. You can find Fisk's first appearance in a set produced by Kellogg's in their unique 1973 release. 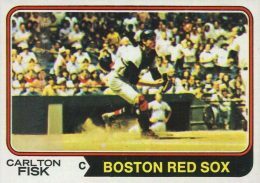 Rather than the 3-D Super Stars cards that they made famous, the 1973 set featured cards that were more traditionally printed. This has allowed collectors to find cards from this set in pristine condition, which is rare with the 3-D Kellogg's cards that often crack and bend over time. 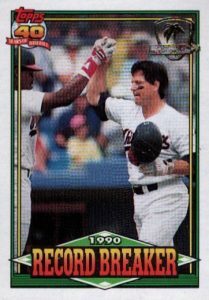 It is fairly uncommon when one of the final cards from a player's career is also one of their most valuable but that is the case with Fisk's appearance in 1993 Topps Finest. To be more accurate, it is the Refractor parallel that collectors demand the most and it is believed the print run is limited to just under 250 copies. Refractors were found 1:9 packs in hobby boxes of 1993 Finest which gave rippers two of the shiny parallels per box, on average. The first of two autographed cards to make the list comes from 1999 Upper Deck Legends and the Epic Signatures insert features black-and-white photography with Fisk in his full catcher's gear. His blue ink signature provides the only color on the card and his signature often looks hurried. It is notable with his oversized "C" that has a fish-hook-like top curve and a backward "F" to begin his last name. Fisk is featured on three separate cards in the flagship 1991 Topps set. While none of these are particularly noteworthy in base form, collectors have a trio of chances to track down one of the limited copies featuring the Desert Shield logo. 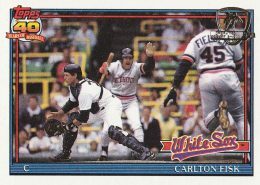 Along with his main card (#170), which features a play at the plate with Detroit Tigers slugger Cecil Fielder running towards home, he also has an All-Star card along with a Record Breaker subset honoring Fisk passing Johnny Bench for the most home runs as a catcher. You can literally see the dirt fly in Fisk's 1974 Topps card as he surveys the field and seems to be anticipating a throw home for another play at the plate. Although it is obscured in the card below, Fisk would wear jersey #27 during his time with the Red Sox. When he joined the White Sox, he found that #27 was taken so he reversed it and wore the unusual-for-baseball #72. He is the only player to have #72 retired by a team from either league. 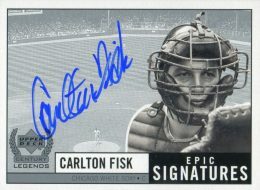 The very first certified autograph for Carlton Fisk can be found in 1997 Donruss Signatures. The set was groundbreaking in that it offered the earliest chance for authentic, pack-pulled autographs for many MLB stars. 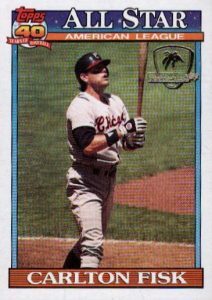 Each foil card is limited to 2,000 copies and Fisk is featured in his mid-1980s Chicago White Sox uniform, making it a particularly interesting card for fans of The Southsiders. After Fisk's star-making 1972 season in which he became the first unanimous Rookie of the Year selection, it is no surprise that Topps gave him the All-Star Rookie designation on his 1973 Topps card. The reverse side mentions his famous family nickname of "Pudge" and Carlton wasn't the only baseball player in his family as two of his brothers were drafted. 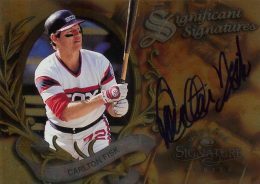 The card offers collectors on a budget a great starting point in building their Carlton Fisk card collection as there is a steep drop-off in value between this second-year card and the next card on the list. 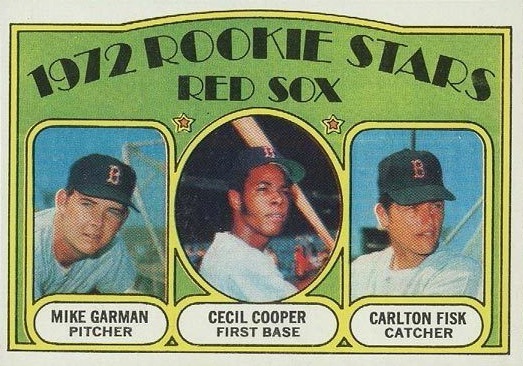 Fisk shares his 1972 Topps rookie card with future All-Star Cecil Cooper which gives the card a slight value boost and a popularity that is hard to match in the set. Up to that point, Fisk had only played in a handful of major league games and had spent nearly the entire the 1971 season in the minor leagues. Based on this, it seems rather unlikely that more than four decades later collectors would pay $1,200+ for mint copies of this card. 2018 TOPPS TRIPLE THREADS CARLTON FISK AUTO #11 18 SSP RELICS WHITE SOX!